The rooms at Zillah Lakes Inn are named for nearby American Viticulture Areas, also referred to as AVAs. There are 7 unique AVAs within half a day’s drive from Zillah Lakes Inn. The largest AVA in Washington State is Columbia Valley AVA, which in turn encompasses offshoot unique growing areas, (AVAs) within it. The largest, and first federally recognized Washington State AVA is Yakima Valley. Yakima Valley suite is Zillah Lakes Inn’s largest, premium accommodation. It boasts views of the lake from 2 rooms, one King bedroom, full kitchen and living area. Horse Heaven Hills room is our next largest premium King room with a view of the lake, specialty linens from Europe and a spa shower. Rattlesnake Hills and Columbia Gorge rooms are premium King rooms with the lake view and lakeside patio as well. Lakeside rooms bring the ambience of our peaceful setting right to your room. Naches Heights and Red Mountain rooms are deluxe accommodation on our quiet neighborhood street. They both have the same King bed and other amenities to make your stay comfortable and relaxing. Snipes Mountain is our ADA approved, deluxe x-long single that includes handicap parking, rails in the roll-in shower/toilet area. It’s located on the quiet neighborhood street and includes all other amenities of our other rooms. 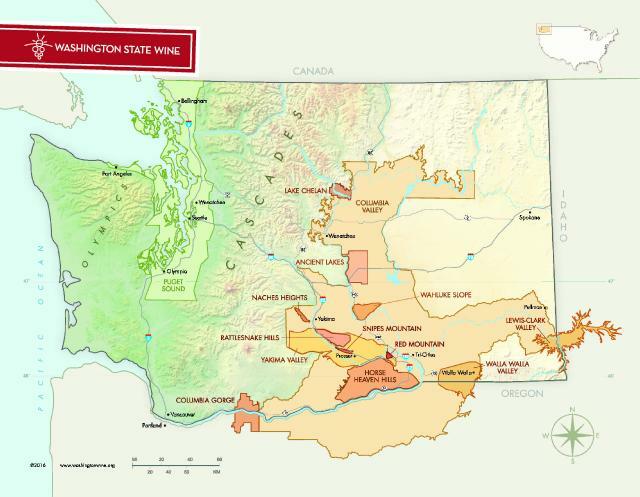 Learn more about Washington State AVAs at the Washington Wine Commission.